Home/office design/Open Office Plans Vs Cubicles: Which is Better for Your Work Space? Open Office Plans Vs Cubicles: Which is Better for Your Work Space? There is an ongoing raging debate in the office world over which is a better working environment for employees, open office plans or old fashioned Cubicles. The best way to sort through this debate is to list the plusses and minuses of both. 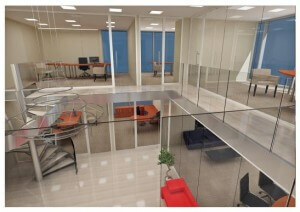 With open office plans, space is utilized to its fullest, especially where small businesses are concerned. This cuts the costs of electricity and heating with more efficient space use. An Open Space Office means less lighting use that covers more employees. Communication between employees and colleagues improve when everyone is not holed up in their own little cubicle world. Everybody in the same room brings everyone together and on the same page. Open Space Offices open up professional relationships on a personal level that standard cubicles cannot. Morale improves with tighter working relationships as doe’s team working abilities, doing away with isolationism. Companies with Open Space Office Plans have different departments collaborating and delegating daily business together all in one general area. Business runs smoother and tasks get done quicker than when everyone is separated. The main complaint of some employees about Open Office Spaces is the noise that putting everyone in one large open room naturally induces. This breaks worker concentration, thus interrupting their thought processes. The close proximity of workers on the phone to clients and other companies causes overlapping separate conversations. This can really hamper productivity, forcing those who can, to search around for a quite spot with phone access, those who can’t like the receptionists are stuck where they are, and clients on the other side of the line hear clatter rather than what the worker is trying to convey. When different teams on different projects are working in the same open space, one rowdy team can severely impact the concentration and productivity of another stuck in the same working environment, even if they are across the room from each other. Creating “Zones” or “Neighborhoods” with separate areas for teams for collaboration, and separate desktop and phone areas, plus quite zones with power and wireless connect ability for single workers. 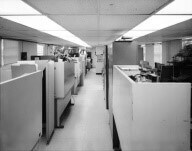 Build “Closed Areas” for workers who need the old cubicle in order to work efficiently – people have different personalities and working needs, providing them to employees enhances productivity. Some workers just do better alone in their own personal space. Some people even deem it cruel to force employees into open areas that they are not comfortable with. Numerous studies point out the fact that for some productivity and morale both drop for some employees who cannot adjust to Open Space Offices. All the things that workers have to search for or call dibs on just to do their work in an Open Office Space environment are all waiting every morning in the same spot for employees who prefer a Cubicle working space, allowing them to get right to work. Some workers complain about the dehumanizing effect of not having a permanent place to hang pictures of loved ones, post reminders on the walls, or pin up important worksheets, documents and etcetera. Some people who work in standard Cubicle Offices feel like rats stuck in a maze for eight hours a day, starting from the minute they walk off the elevator and are confronted with the endless rows of cubicles to navigate around before finding theirs like a piece of cheese. Many studies also find that workers in general are less creative and inspired than workers in an Open Office Space environment. This is one of those things that are based solely on human nature and individual personality traits. Where as Open Space Offices are usually awash with color, views to the outside world or even inside atriums, all designed to inspire the employee and stimulate their minds, Cubicle Office Spaces are not even close to any of these inspirational things; they are frankly bland and to some, soul crushing. What some workers find comforting about having their own private Cubicle space that is isolated from the rest of the crowd in the office, others find demeaning and isolated to the point of being mind-numbing. These employees are the ones that are more productive in an Open Space Office layout. Provide open area break rooms to help counteract the claustrophobia of eight hours in an Office Cubicle. Provide group lunch areas where employees can collaborate and intermingle at during their lunch break. Provide collaboration rooms for employees, teams, and peers to be able to meet in during work times, outside of the Cubicle box. Different things work for different people. This is why the debate about whether Open Office Plans Vs Cubicles, Which is Better, will continue to rage on in the office world and studies will continue to show conflicting data on the subject. The truth is that they are both right, and both wrong in their own ways. Walking the middle ground by designing both Open Office Spaces and Cubicles in the workplace is the best course of action for keeping both factions of Open Space or Cubicle loving employees happy and productive; reaping in the benefits of both worlds and avoiding the pitfalls of both as well.